They are widely used in aerospace, nuclear and medical industries. They are available in plastic, steel, stainless steel and brass. They are used largely to transmit motion rather than power. They have high tooth strength. Fine pitch gears are inspected by functional testing on a variable-center-distance fixture. They do not lend themselves to the kind of detailed tooth measurements because of their small dimensions. 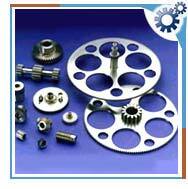 Fine pitch gear is used widely in oil industry and for automotive transmission.